The Perth Mint has released the 2016 “Famous Ships that Never Sailed – HMS Thunder Child” One-Ounce Silver Proof Coin, which has a mintage limited to 3,000 pieces and is available for $90.00 AUD ($68.03 USD). 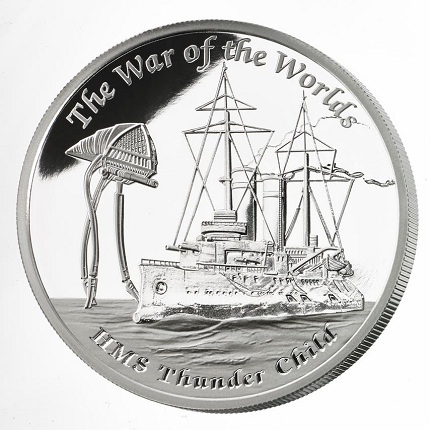 Coins in this series feature famous fictional ships from art and literature; the HMS Thunder Child was an ironclad torpedo ram destroyed by Martians in H.G. Well’s 1898 classic, The War of the Worlds. The coin is composed of one-ounce of 99.9% silver, measuring 40.60 in diameter and 4 mm in thickness. Its wooden presentation case resembles a storybook and is accompanied by a certificate of authenticity. The coin’s reverse features a rendering of the HMS Thunder Child being approached over water by a Martian fighting machine. Inscribed along the rim of the design are THE WAR OF THE WORLDS and HMS THUNDER CHILD. 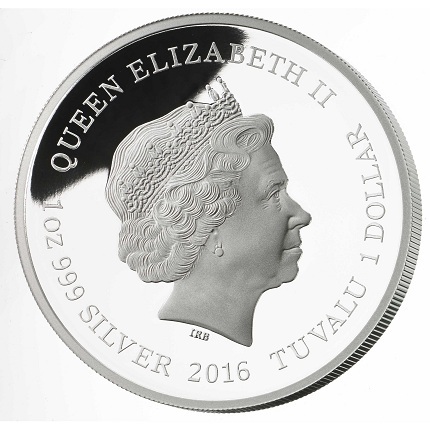 The obverse carries Ian Rank-Broadley’s effigy of Queen Elizabeth II, with the inscriptions QUEEN ELIZABETH II, 1 OZ 999 SILVER, 2016, 1 DOLLAR, and TUVALU, the country of issue, placed along the rim. For more information on new releases from the Perth Mint, please visit its Web site.